We have changed and this month we are now Greenheyes.com as we now have some sponsorship. Thanks VERY much to Jim Chadwick our agricultural agent for arranging this. 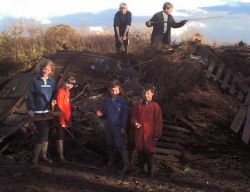 November started with a bang as we had our bonfire on the 4th and here is a picture of our helpers thanks to James, Ben, Adam and Daniel as well as the regulars of Simon, Sarah, Hannah and Becky. On the 1st we bought 12 more pigs from James Bennion a friend and fellow farmer at Byley and he showed us this sow that had farrowed (given birth) the previous night. 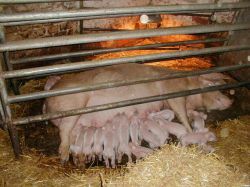 Here she is with her litter of 17 piglets. November has been horrendously wet and click on this FLOODS link for a full description. On the 7th I was invited to attend the opening of a LEAF demonstration farm at David Johnson's Greenhills farm Leaf promotes very similar principals to those used at Greenheyes and David's farm is open to the public. Click on the link to find out more or to find a Leaf farm near you www.leafuk.org . 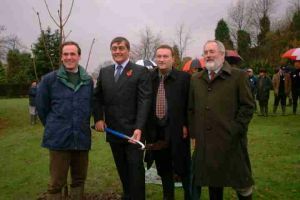 The farm was opened by the Duke of Westminster and this photo shows (left to right) David, The Duke, our Minister for agriculture Nick Brown and Spain's agriculture Minister Miguel Arias Cante. 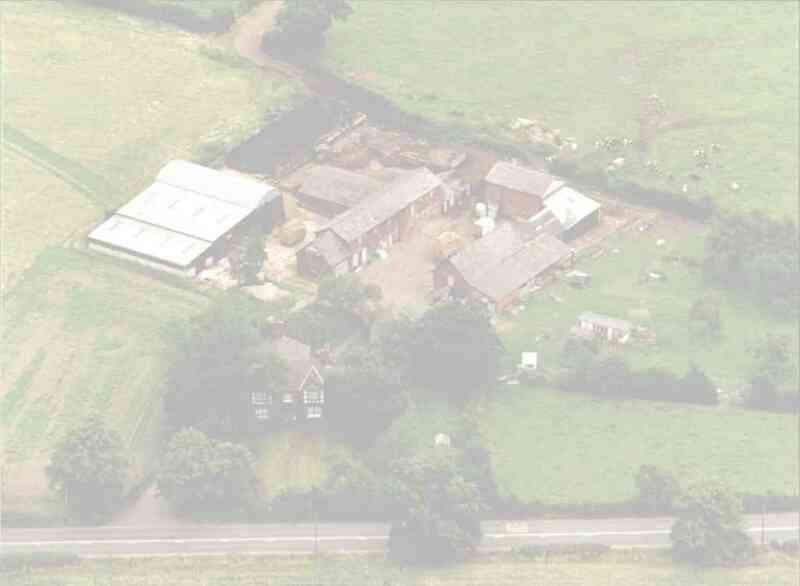 I did get to speak with the Ministers and gave them our cards offering them a virtual visit at Greenheyes.com. 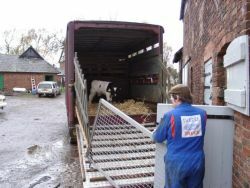 We have had 2 calves this month and last months have been sold this picture shows the wagon being loaded for market. Some of you may have seen the "little red tractor" symbol when out shopping well if you travel the A54 from Middlewich it can now be seen on Chris Whitby's shed as the picture shows. This logo is a quality mark supported by all the major supermarkets (perhaps you can play "spot the tractor " on your shopping. 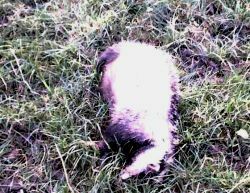 Yesterday I was checking the fences by the road as the heifers are still out (all 17 of them) and I found this poor little chap who must have been hit by a car the previous night and staggered into the field and sadly died Unfortunately due to their secretive nature this is usually the only time we see the badgers. Finally Christmas is coming and our local garden centre (Booseys of Middlewich) always has real Reindeer as an attraction. We always supply their bedding straw here are the Reindeer with centre owner Paul Morris I hope everyone has a very happy Christmas.